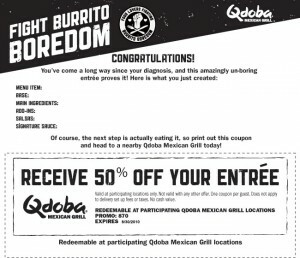 Be Broke But Happy: A free Qdoba Mexican Grill entrée in your future? Is there a Qdoba Mexican Grill in your neighborhood? There is just yards from my front door, and I have come to really appreciate their salsa verde and poblano pesto. There is a Chipotle about equidistant in the opposite direction, but I tired of their menu and quality of food. Methinks Qdoba is a bit better. Anyway, I just created an entrée on their website and then printed a coupon to get the entire entrée free, (even better than the above offer) with purchase of a beverage. Give it a try, and enjoy a pulled pork grilled quesadilla con salsa verde (my selection). Coupon offerings print out differently for different folks, so give it a try--I hope you come up with a free entrée, too. Go here to find out. Remember to sign up with your "generic" or "default" email addy, right? Hope to check it out next time I make it to Fayetville. The Mexican Gumbo looks good to me.